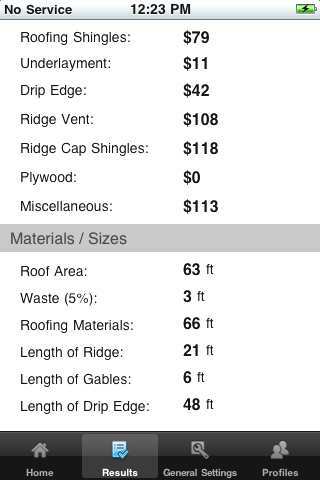 Calculate prices to install Asphalt Shingles, Cedar Shingles, Clay Tile, Metal / Standing Seam Roofs and Flat Roofs such as EPDM rubber, PVC and TPO membranes. This Free calculator tool helps homeowners and contractors estimate total roofing project costs. Prices include cost of roofing materials, roof tear-off and labor. Learn how to use our Roofing Calculator - a step-by-step guide that will walk you through every setting in our calculator, so that you can get the most accurate price estimate - click here. TOP FEATURES: - Calculate Multiple Roofs! 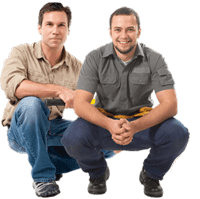 - Modify ALL Labor & Material Costs! - Get Full Materials & Labor Price List! - Save & Export Results by Email! - Include Chimneys, Dormers & Valley! - GPS Location Records Job Address! Quickly and accurately estimate steep slope roofs! Provide your customers with a nearly instant price quote! Save time and increase your sales ratio! Multiple settings for complicated roofs! Roofing calculator can be a great tool not only for contractors, but also for real estate agents, home inspectors, and insurance adjusters. All of these professionals can use this app to estimate roof replacement cost for their clients, right on the spot. All you need to do is ask a local roofer that you work with to set up their prices for you, and just plug in house dimensions into the calculator to give your client an approximate replacement cost of installing a new roof. Watch Roofing Calculator Android app video on YouTube. Also here is a Roofing Calculator iPhone app video. Metal Roofing Calculator - We have added a specialty Metal Roofing Calculator, which will provide installation prices for the most common types of metal roofs, as well as estimate roof life expectancy and Cool Roof energy savings. Roof Pitch Calculator - quickly calculate roof pitch, convert pitch to angle, get gable length and roof area size based on roof dimensions and pitch. Roofing Materials Calculator - quickly estimate the cost of materials (roofing shingles, metal roofs, etc) and the amount of materials and accessories you will need to install a new roof. Metal Roofing Panels Calculator - estimate length, and amount of standing seam panels you will need to install a new metal roof on a gable or hip type roof. Roofing Calculator for your website - completely FREE! Residential roofing prices guide - learn how contractors arrive at their prices using per-square cost structure or Labor, Materials, Overhead & Profit cost structure. Research the metal roofing prices - find out how much it costs to install a standing seam, metal shingles or a copper roof in Massachusetts, Connecticut and Rhode Island. March, 2012 - We updated our calculator software to reflect the rising cost of roofing shingles that we reported back in Aug. 2011. In this update we adjusted prices to install 30 and 50 year architectural roofing shingles and EPDM rubber membranes. See the summary of the software update here. October, 2010 - We added a setting to select the number of stories in your house - from one to three story homes. We also added steep roof up-charge and an option to select the Ridge Vent installation in linear feet. Read more about roofing materials and prices update. August, 2010 - Roofing Calculator updated to v. 3.0. NEW progressive pricing algorithm accounts for smaller residential projects (under 700 sq. ft.) - prices are adjusted to account for smaller size job. Now you can also estimate the cost of skylight and chimney flashing, as well as ridge vent cut-in and installation. Thank you for using our roofing calculator - we sincerely hope it was useful and helped you. Please leave your comments and feedback in the form below - we want to know what you think and have to say about our calculator. Your feedback helps us improve the quality of this great tool, so more people get more accurate results. Yours truly - RoofingCalculator.org team. +++ * Roofing prices are estimated and will vary based on your geographic location, local market conditions and other factors, such as fluctuating costs of materials. ** Roofing prices are calculated based on the assumption that you are working with a reputable, fully licensed and insured contractor. Slate roofs will last as long as a number of hundred years, and it’s often extra economical to restore them than to replace them with different materials. A roofing contractor conversant in slate roof repairs offers you the perfect price and have the ability to match the size and color of current slates. I am building a roofing website and need a materials calculator for elastomeric spray/roll coatings for flat roofs. Do you have such a calculator or know where I can get one. I’m not sure you can find something like this. We can create such calculator for you. We would need more info from you on what exactly you want this roof coating calculator to do. Email me – info @ roofingcalculator.org – we can discuss detials and cost. Cannot enter a number for sq. ft. on the very first line. IPad app. Are you using the latest version of the app? If not, please update. We’ve fixed this issue a few months ago. If you are using latest version, then please let us know as this could be a new issue. For now, you can tap the 2nd size box, and when keyboard pops up, press Prev. key to move cursor up to 1st box. To install the app on new phone, you need to login to Google with the SAME account that you used to purchase the app. It will show as “purchased” under “My Apps” in Google Play Store. You can install it from there. PS, I am sending this to you as EMAIL as well. Dear Leo we are a mobile development company in New Zealand, can the app be reskinned with my clients logo and used as a branded mobile tool. We would be interested to onsell. I have your Roofing Calculator Pro (version 2) and was wondering if you could make a few modifications that will make it work more like the spreadsheet I have been using. send me your spreadsheet, and I will see if we can incorporate it. I can’t promise that we will though, because the app needs to be universal, so it can work for other roofers as well. Thanks for buying our app. To change the price for labor (per sq.) you need to go to Settings >> Roof Materials, choose the material you want to change labor for, and it will be there as Labor – $ / square. The cost for installation labor is tied to individual materials, as you can have slate or cedar shingles and labor for those would be higher than for asphalt shingles. Thus each material has its own labor setting. If you don’t mind, please leave rating on the App Store (or Google Play Store), and a comment, if it’s no trouble. Thanks. The calculator is brilliant. I don’t do roof work. It’s too dangerous for me, but I am a handyman. Most of my clients are single women who rely on me to keep their houses maintain. I was recently asked to help a client choose a roofing contractor. Your calculator was very helpful in determining what to expect with expenses. Very helpful. Thanks again. I cannot find your app in the app store. Can you assist? Im using an Iphone 5. Thanks! I will look into that – I believe it should be available on iPhone 5, but I will go ahead and check it out. I checked it and roofing calculator app is available on iPhone 5 – the reason you might not have found it is because app store works different from what it was in iOS 5 – the search results now show one at a time (not as grid) and you have to swipe to the right once or twice, after you search for “roofing calculator”. I like your roof calculator. Any chance you would be interested in doing an app like this for my business…we make custom sized reclaimed wood furniture and I would love to have a calculator do this same thing for our variables on our website so clients didnt have to wait for our sales team to get back to them right way. let me know how much you would charge? Can you add a vents option other than ride vent. Just so we can select the type of vent, be it a goose neck, flexible or ridged vent square vent or even a phoenix vent. That would be great. Thanks. did you want that in a free online version or in the paid PRO app for iphone / android? If for the pro app, I will see how to best implement it, but for now you can include all the vents in MISC field at the bottom of main calculator screen. MISC costs are calculated individually for each roof section and added up at the end. I work in the service department at a commercial roofing company. Would i be able to customize this app to work for commercial repairs? But it will be somewhat confusing to say the least. However, we will have a flat-roof specific roofing calculator out in about a month or two. That will allow you full control over anything flat and low slope. We will design it for single ply roofing (Rubber, PVC, TPO), but I think it will also be very usable for modified bitumen roofs. Not so much for tar and gravel, but still, it will be much more convenient than current app, designed for sloped roofs. We still did not decide how to distribute it, but I will email you when it is out. Also I’m from Canada and in our area you dont see much ridge venting…wondering how to input number of vents required and according costs related. Thank you for buying our app. Multiple sections update is on the way – testing it now. The way it’s calculated – we take price of a 20 ft. roll and add labor per foot to install – so you can set roll price to 0 (in materiel profiles), and set labor price per foot (in Roof Settings, under ridge vent), to what you would charge for installing 1 box vents. Then on main screen just enter number of vents you want to install. That all. Wanted to let you know that Roof Calc v2 is available for download – please update. Now you can do up-to 10 roofs at a time! And many more things – all the way to sending your client formal proposal right form the calculator app. Please let me know what you think / what we can improve or add to make your job easier, and help you sell more roofs. Please also rate the app / leave feedback on app store / market. Will this app save customer info? is the calulatltor in dollars or english pounds? One of the best online roofing calculator i’ve seen onlin. Thanks for sharing this one. Dear RoofingCalculator.org, your calculator is off on its calculations for roofing. If you can make a simple calculation of length 21’-0” x width 3’-0” = 63 sq. ft. Per your Roofing Calculator Pro for iPhone it is not even inside the domain to be close, it tells me that the roof area = 89 sq. ft. If you use the same number and zero out general setting you find that the roof area = 89, Waste (0%) = 0’, roofing materials =- 89’, length of ridge = 21’, and length of gable is 8’, length of drip edge = 50’. So 21’ x 2 = 42’ + 8’ = 50’, how cool is that. Where does the 8’ coming from, the input is 3’ x 2 = 6’. If 21’ write, and let say we split your 8’ to 4’ that comes to 84 sq. ft. That is 21’ x 4’ = 84 sq. ft. This is still 5 sq. ft. less than your roofing calculator pro at 89 sq. ft is. If there is a good explanation to your math, please give it to us. I just replicated your calculations and the results I get are shown in the attached image below. I get 63 sq. ft. The reason you may be getting 89 is probably because of roof pitch. I set mine to 0 pitch to get 63. Drip edge – calculator rounds up the number of drip edge pieces to nearest 10 – because for 42 feet of drip edge you will still need 5 pieces of 10′ each – they don’t come in 2′ sections. Plus you will have an inch or so of overlap. The rounding happens in PRICE calculation. Actual length of drip edge is provided in results. I got 48′ of drip edge, with roof being 21×3′ with zero roof pitch. Basically we tried to make this calculator as realistic as possible to real world roofing, so that you as a roofer could rely on it when calculating roofing materials / prices. If there is in fact a bug in calculation (besides using incorrect setting) – I will gladly get them fixed. On the other note – we are doing a major overhaul of both Android and iPhone versions to bring the most requested features to you. We will upload them to App Store and Android Play Stor (Market) as soon as they are ready and polished out. I would say about 6-8 weeks. I’m trying to get it done as soon as possible, but it’s a big project, and we need to test everything thoroughly before making updates public. Calculator is way off on its suggestion for roofing! I got a quote of $6384 which was extremely high for a 400sq/ft roof! And it only cost $1435.83 that is a big difference!!!!! I would not trust this calculator but on the plus side I saved a lot of money by pricing stuff myself. If you make such claims, you need to provide supporting information. I have no idea what you used to calculate your roof, and who is giving you prices – therefore, unless you provide more info, your comment makes no sense. Since all sales of roofing calculator app are done through App Store or Android Market (I don’t know which platform you are using), you can get receipt from either app store. When RIM releases PlayBook OS v2, it will support Android Apps, and we will release Roofing Calculator for BlackBerry Playbook. Later this year RIM should release BB OS 10, which is based on QNX (same as PlayBook os), and those new phones will also support running native Android apps, so Roofing Calculator will work on those new BlackBerries. Wondered if there is an app for Blackberry out there? Roofing Maine highly recommends the calculator. Our customers love the tool. They feel as though we are treating all the customers equally regardless of what we charge. Thanks for your help in better understanding how your app works. After your explanation about the menu button on my phone, I was able to go back and update prices on materials & labor. I have had a chance to use the app and it works as advertised. Great job and GREAT PRODUCT!I will definitely recommend it to my friends in the business. I downloaded the Roofing Calculator for Android today. After watching the videos, it seems something is missing on the app. First, there is no menu button to change settings for material & labor prices. The only 2 buttons on the app are ‘Contractor Mode’ & ‘Presentation Mode’. They are both the same and there are no menu options. Please tell me how I can get this added to the app. What you are seeing is the “splash screen” where you can choose in which mode you want to run the calculator. Most of the time you will choose Contractor Mode – Presentation mode is only for you to show the total price to the home owner. Once you choose the mode (say contractor mode), you are on main screen of calculator – to go to general roof setting or roofing materials profiles (prices), you will need to press “MENU” button on your phone, and a menu will pop-up at the bottom – then you choose which settings you want to go to. Exactly as in the video. Bret – we are working on adding these features, and many others. We are trying to do this asap. Thank you for your patience. As far as side step – you you can email results, but it is useless as a “roofing calculator” … it was created by programmers – not roofers, and does not do anything besides straight gable roofs, and no customization. My name is Adam Shapiro, and I am a business development manager with Cisco. We introduced a new Android tablet (called Cius “See Us”) into the marketplace focused on enterprise customers. We created an application shop called AppHQ– which will be available directly to our customers. As I was researching through Android applications we would like to have in the shop, I noticed your Roofing Calculator app, and thought this product would be a great addition to the Cisco portfolio. With the great customer base that Cisco has, your inclusion into this portfolio will allow your company and application more exposure and visibility from the congested app marketplaces out there. To date Cisco has sold over 30 million IP Telephones globally. We anticipate that the Cisco Cius tablet shipments will exceed this sales curve. To further discuss your submission for distribution through our shop, please either contact me directly at (832) 860-1138 or email me at adashapi @ cisco.com. For further information, please visit our developer website ciusdeveloper.com. The developer site will allow you to register and test your application within the emulator. Once you are comfortable with the look and feel, please submit your .apk through ciusdeveloper.com for UI and Security testing. Once passed, we can move to fully on-boarding your application. I read about your company searching for job online…I am an Aluminum Roofing Engineer. I want to know if I can secure a job in your company. I wait to read from you soonest. Roofing Calculator is informational site about roofing. We don’t have a need for an Aluminum Roofing Engineer. I think your best bet is to contact metal roofing manufacturers – they are the once likely to hire you. There are several in Canada – biggest one is Delta Building Products in Vancouver area. Leo, thank you for your response. I have the app on my android phone and would like to purchase is. But I am wondering if their is a way to be able to print an estimate using the app on my phone and a portable printer? We currently don’t have a way to print out estimates. The plan is to have an export option for the results, that you could email to yourself, or a “somewhat official” estimate that you could email to your client. We are figuring out how to implement this option, in regards to which email client the app will use – a default one, or Gmail, or something else, and how it will work, as far as possibly sending a PDF attachment, or plain text email with roof calculation results. I am wondering if it is at all possible to be able to print an estimate for a customer with this software. @ Brian – click CTRL+P (for windows) and it will print the page (though it will also print the rest of the page not just the calculator). You can also just highlight the calculator, once you calculate roofing price and also do CTRL+P and choose “print selection” in the print prompt. It would be somewhat similar for MAC. The labor cost is built into the total price. All roof prices are approximate and will depend on your location and the roofing contractor you choose. Also, all roofing contractors have different ways to price their labor costs, and also have different overheads, etc. See our roofing prices guide to get a better idea on how roofers price their roofs, and to learn abot overhead, labor costs, etc. I was just checking out your Roofing Calculator app in the App Store. Found it among the New Releases. Congrats, looks pretty good. Thanks very much!! The price variation was not much, about $400 on the lower end of the range if I recall. But that was enough to make me wonder. We have not moved forward with the roof yet, but are awaiting one estimate and seeking another contractor to provide a Metal Roof estimate. The first contractor said they do not install the sheet metal roofs. The information you provided here is VERY detailed and very much appreciated! Thank you so much! ~ Dennis Jr., Suzy and Dennis Sr. I am helping my father to estimate the cost of replacing his simple, moderate slope asphalt shingle roof with two skylights and one chimney. The costs shown on your calculator seem to be higher than other roofing calculators online, not by very much mind you, but what do you think could be the reason for this? — Are there geographic/regional factors to consider? We also discussed what how the cost might be different than a neighbor who had their roof replaced 5 years ago; in light of rising fuel price’s effect on materials. Thanks very much! As far as your neighbor’s roof – here is the thing: 5 years ago, a square of 30 year architectural shingle was about $60 … today it’s almost $100 … nails, felt, ice and water, ridge vent, ridge cap shingles (or 3-tab shingles) – all vent up an average of 40-60%. Gas – you remember – it was about $2 before Katrina and $3 after … now it’s $4 again – 100% increase. All other prices (not related to roofing) – taking a 3% inflation, should be up 15% …. Therefore, roofers HAVE to charge more, to eat. … so yea, your roof will be more expensive than your neighbor’s fairly new roof from 2006. Excellent post, and I will be downloading your Android phone app too after trying out the demo. I saw your app on the android market…downloaded the demo version. Very cool app… I want one for my type of work. I waterproof flat roof decks over living spaces…pretty similar to a low slope roof except we install pedestrian traffic coatings. Call me or email me and I’ll tell you what I’m thinking and maybe take it to market? Thanks for your interest in our Roof Calculator app. While we don’t develop new apps for just a single user – good news is that we will be adding full flat / commercial roofing calculator functionality very soon (in about four weeks). The calculator will be based on our flat roofing calculator used on CoolFlatRoof.com, but will have all the features of the Calculator app, such as different roofing materials profiles, etc. The Flat Roofing calc will also be able to calculate roof decks, and we are actually planning to make a dedicated flat roof deck calculator for our website, but everything is just taking longer than planned. Right now our priority is to release Roof Calculator for iPhone and iPad, which we are close to, and once it is released in the App Store, we will begin adding new features that were most requested but our clients. Read at the bottom of iPhone roof calculator page to see which updates will be added. Since you’ve requested the flat roof deck calculator, please let me know exactly which features you want to see in it – this will help us make the app more versatile and useful for all roofing contractors. You can post right here or via email – roofcalc @ gmail.com – we use this email mainly for customers buying the app. confused. When entering roof dimentions, is that a one side perimeter ( LxW) or ground dimentions ? Length x Width is the ground dimension on your house – if your roof has overhangs, add those to the LxW measurements. For slope adjustment, use appropriate roof pitch setting. 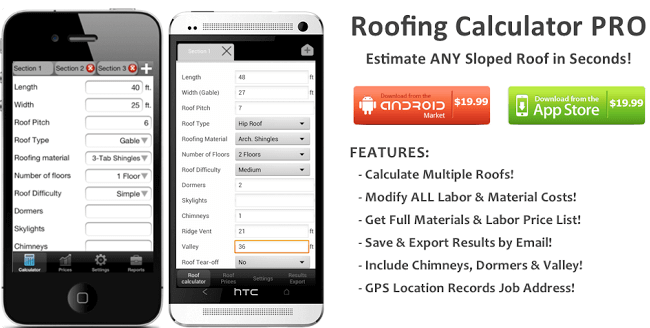 I understand that you purchased our Roofing Calculator app for Android. We do not provide phone support, but you can ask your questions here or over email – roofcalc @ gmail.com and I will be happy to help you out. I can’t seem to find the app for my Iphone. Is it availible yet? iPhone version of roofing calculator is in development right now and should be available in the App Store in 2-3 weeks if all goes as planned. We are doing our best to make it faster, but we also want to make sure we port all features of Android roofing calculator in it as well as make it bugs free. Also with iPhone we kinda need to make it compatible with iPad’s large screen resolution, which will take some additional time, but will give you an excellent roof estimating and slaes / presentation tool. I will soon release an article on how you can your the roofing calculator app not only for estimation but also for presentation to the customer, where you and the customer can sit down and go over the options and ahve the pricing results immediately in front of them, while not showing them your labor / material costs. We introduced this “Presentation mode” in the Android app version 1.1 and are working to make it more efficient. thank you. I have to replace my roof, being a single woman, I was afraid of being taken advantage of. your calculator gave me an estimate so I have an idea of the reasonableness of the quotes I’ll be receiving. Thank you. As I’ve mentioned before, this is a universal roofing calculator and cannot account for local market conditions everywhere. At the same time, you mention that the roof is an insurance job, so why are you shopping for the LOWEST bid? I mean with lowest price you will 95% of the time get lowest (crappy) quality, usually non-existent warranty on your roof, and a bunch of other fun stuff, like roofing shingles nailed into thin air (that is roof decking rotted that it’s no longer there – I’ve seen it done by “professional” metal roofing crew) so what do you expect from roofers working for peanuts? While I like the calculator and the ease of use the figures are a bit off. I literally had 9 bids on my roof for a 30 or 40 year shingle and a few phone interviews aside from that where they gave me rock bottom numbers as I let them know I was giving it to the contractor that gave me the best price with no haggeling and the prices on this calculator are 10- 20% lower than I could find on the lowest bid with all that shopping and I’m used to cutting deals. Now my deal includes the installation of a new vent and about 110 feet of new facial board. 70 feet of wood replacement was included in the base price so it really is only 30 ft more and my home does not have or require plywood so it is only facial board. It also includes Storm Gaurds etc. Possibly because my home is in California and I know the insurance and contracting costs are far higher here than other parts of the country that could explain it. I have owned income property elsewhere which the contracting costs are about 1/2 than here for that reason. When you put in the roof measurement on the calculator, does it calculate for a 2 sided roof or is it just the one side? Of course it calculates for both sides … though it is irrelevant how many sides there are – be it a shed roof, a gable roof or even a hip roof, the roof size will be the same – geometrically speaking. What will change is the waste factor – hip roof will have most waste. So unless the roof is really cut up – say bunch of dormers and other fun stuff, the roof size will be the same. I actually could not believe it myself at first – I for some reason always thought that a hip roof type will be larger in size, but after running it through a series of different calculations, I realized that with the two roofs with the same foot print – one gable and one hip roof – and with the same roof pitch, you will get identical measurements. Excellent site educated me to make a good judgement on the estimates given to me by different roofers. The detailed drawing further eased the complicated terminology. Layman like me its worth 5 stars. I really like your application and think you would be able to benefit greatly by adding a field that determines how much the stripped roofing will weigh. Additionally, you could add a basic field that would recommend what size dumpster a consumer would need to rent in order to accommodate all of their waste. These numbers fluctuate but based on the number of squares, you can determine roughly what the materials will weigh and the cubic yardage. Please let me know if you are interested in adding this and I will be happy to figure out an equation. It would be great if you can help us with figuring out the equation (I can estimate the weight, but not the volume and the size of the dumpster). I will think how we can integrate it into the calculator, and will add it in the next calculator update, which should be coming in the next few weeks. BTW, the update will include the number of floors in the house which will affect price per square, as well as option for ridge vent, plywood replacement and other options and price adjustments. im running a construction business in South Africa,can anyone tell me where can i get a software that can calculate in a SOUTH AFRICAN CURRENCY,and further more who decide the price estimate on square meters? My name is Jack and I have just started a roofing business in Vancouver Canada. I intend on becoming the market leader here in Vancouver and In my research came across your roofing calculator. I think its an excellent tool and actually something I would like to be able to offer directly to our customers. I think it would be excellent if the customer could price their own job. I would rather the customer could opt to do this. I actually think, as a service if it starts to work and I see that the results are accurate, meaning the customer is mailing us back the details, that we could charge a $2 thrown onto the bill as a dressed up “admin cost”. I see your software as an advantage to me and would thus like to incorporate it into the business. Interested in possibly integrating a custom version of Roofing Calculator into our website. Please tell me how pursue. If you need a custom programmed roof calculator with additional features and different prices, that relate to what you charge your customers to install a roof, as well as using Canadian dollars instead of US $, as well as meters instead of feet, we can do all that. Simply respond in the comment box below, and we can go ahead and start working out the details and pricing for you. My son is in the roofing business in Canada and I am looking for a roofing calculator to add to my new and up and coming classified ad service like Craig’s list but much better. I am starting with the car section of the ad service but will be adding all the categories just like Criag’s List but much much easier to use with a search that will allow much more flexibility in the search process. I am looking for a partnership with the right group where I will advertise and promote their product through out North America….for the use of it here in Canada. If you might be interested in talking about this please let me know and I am wondering what the prices per square are set at….and if they could be changed easily for Canada if we did some kind of deal…?? If you would like to talk to me …please either send me an email or a number to call you and I will..
We can definitely do something and create a custom roofing calculator, that would reflect roof prices in Canada (you would have to provide pricing structure, as I’m not too familiar with Canadian roofing market). This calculator would also be in Canadian dollars, and we can add custom functions to it, upon your request. We will be improving our roof calculator very soon, adding new functionality and making the roof prices more accurate – possibly even include major metropolitan area selection for better accuracy. All this functionality can be implemented in your custom roof calculator. I will also be emailing you the copy of this comment (from a different email address, which I normally use). The we update the roofing pricing pretty often to reflect current state of roofing market. The roofing materials prices (mainly cost of roofing asphalt shingles) depend on price of oil. Shingle prices skyrocketed together with oil picking out at $140+ per barrel in the summer of 2008, but never really came down. Now they’ve stabilized more or less, but still there is constant movement. Metal roof prices also spiked along with oil, but also did not come down much, and stayed VERY high for a very long time as manufacturers were sitting on expensive inventory, even when metal prices dropped more than 50 percent. Again these are more or less stable now. The biggest factor which limits the accuracy of roof calculatoer is local economic conditions / natural (weather) conditions in each geographic zone. For example if a hurricane hits in Texas, roof prices there will spike, but will remain the same everywhere else. As for economic conditions – local roof prices are usually directly related to local cost of living (unless there is abundance of cheap labor – usually illegal). For example, roof prices in Michigan are very low, as many people there (mainly those working for big three companies, lost their jobs). In Boston, roof prices are some of the highest in US, because cost of living in Massachusetts is very high. Another factor is seasonal nature of roofing business. Although many roofers work throughout winter (http://www.coolflatroof.com/flat-roofing-blog/winter-roof-installation/), the average homeowner thinks that roofs are installed Mar. 1st through Nov. 30th. Therefore, competition increases in the winter as there is less work, and to get business, many roofers resort to lowering their prices. Due to these and many other factors, the prices generated by the roof calculator are averaged. We are planning to implement a “Choose your State” feature, which would adjust roof prices to the geographic location, but even within a stat as small as MA, there can be huge difference in roof prices depending on how far from Boston you live. So it make averaging the roof price for major geographic locations pretty difficult and time consuming. Please explain what you mean when you say “Maybe use Means as a guide”. We are constantly fine-tuning the roof calculator formula, to make it as accurate as possible. Right now we are planning some major updates / improvements to the roofing calculator. Would like to see a note about how current is pricing… showing month and year would be helpful! (Ex: Pricing updated as of Jan 2010). Its probably more complicated than you would like to do but a simple factor for major geographic regions of country would also be useful. Maybe use Means as a guide. Thanks for the work you have done.